The best maps are prone to error, landmarks don’t always last for generations, memories fade and even the best tracer wire will corrode over time. To save money, to save time, to protect buried infrastructure, and to protect persons excavating, RYCOM offers the Passive Electronic Marker. Passive Electronic Markers are a battery free device used for marking the position of buried cables, pipes, valves, solenoids, splices and access points. A locator is used to sweep an area and pinpoint buried markers. Since each utility uses a unique frequency the user can quickly and confidently identify the target device. The RYCOM Marker is a device for near surface applications. Detectable to three feet this unit can provide accurate location for all desired buried objects. The unique arrow shape facilitates placement in packed soil. Using a steel tube the product can be tamped down to desired depth. 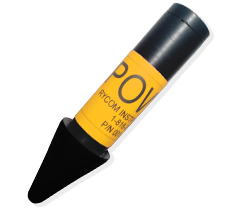 RYCOM offers the 8890-MP, 8891 and 8892 for detecting markers. The receiver provides audible peak tones as the user nears a utility marker. The utility marker will detect and isolate the highest reading during the scan and provide the frequency and utility. Rycom Instruments®, Inc. locators are designed and manufactured to make utility locating as accurate as you need and as simple as you want. For more information on the PEG, or any other Rycom Instruments® locator, please contact your local dealer or call us toll free at 1-800-851-7347.